I laugh at my husband – a lot. This is because I find human behavior very funny, and I get to observe his behavior more than most other humans. Except myself of course. I watch myself obsessively… and I am a riot. My husband can be ridiculous and he can be annoying, both of which are fun to write about. 1. He’s a genius. (and not just because he can see how awesome I am.) He can fix anything – furnaces, cars, computers. He can put a clasp on a bracelet and an axle on a trailer. He can look at the innards of stuff and figure out what each gizmo should or should not be doing, and then he can get them to behave. He built our house. It’s fabulous. And he installed a generator. It comes on automatically when we lose power. That was very handy a few weeks ago. And although it doesn’t provide power to every outlet in the house, my husband made sure that there is power to the outlet where I plug in my hairdryer. 2. He’s protective. I’d taken care of myself for a very long time before I met him. It’s nice to relinquish some of that. I have a champion. He offered to beat up a boss who was mean to me, and although I declined, I did enjoy envisioning it. When we first got married, we lived in a quiet neighborhood. But my husband still worried about me crossing our mostly deserted road to go to our mailbox. “How did I ever cross the street before I met you?” I asked jokingly. “I don’t know. It’s a miracle you’re alive,” he answered solemnly. 3. He likes bad music. When we take a long car trip, he makes sure to pack all his Gene Autry CDs. If, after several hours, I politely request something more modern, he’s ready with The Beach Boys. “The Beatles ruined everything,” he often states, knowing full well that I adore The Beatles. He doesn’t want music that will change the world. He wants a dude singing about his car. But if he’s stuck in time musically, he’s also stuck in a very appealing way. To him, I’m still young, and pretty… and thin. 4. He’s a very serious guy. He worries. He’s not lighthearted. He’s never silly. He’s a built-in challenge that sharpens my wit. It thrills me to get him to laugh. Of course, if I can’t, I can always turn on “World’s Dumbest.” There’s nothing like a teenager smacking himself in the head with his own skateboard to make my husband roar. 5. He can find common ground with anyone. While I sometimes don’t know what to say to a stranger, my husband possesses an incredible talent for making everyone comfortable. Shy people confide in him. Sad people feel comforted. Shrewd salesmen give him a deal. He creates an immediate rapport. Getting ready for a big event one evening, I looked out the window and saw him having a friendly chat with the garbage man. One hour later he was having a friendly chat with the CEO of a television network. 6. He married me. This sounds like a pathetic, needy gratitude. But hell, it’s true. I met him when I was thirty-eight. My life up until then was full of men, each briefly, with long stretches of solitude in between. I wasn’t unhappy being single; as a matter of fact, the older I got, the more I liked it. But at thirty-eight, I did begin to wonder if, just maybe, I might be the teensiest bit unloveable. But I’m not. One crazy, but very smart, guy loves me. This is a beautiful tribute to your husband…he’s a very lucky man to have found you. Goodness…don’t you love our blogging community? Between this wonderful tribute and MJ’s “Date Night” readers can find the Secret to keeping that candle…or home fire burning. Well done NQO. I have thoroughly enjoyed this series: the ring, Cabela’s and now This. A wonderful, wonderful post! While we have actually taken very different paths, I can relate to many of the reasons you adore your husband. I have to say that after 46 years of marriage, Hubby has become a little more open to silly humor than he was when we married. I consider it one of the major accomplishments of my life that I can still say something unexpected enough to surprise him and then make him laugh. A very, very happy anniversary. May you have many more healthy, happy years together. Happy Anniversary. This is and was a wonderful post. In three weeks I’m looking at 50 years. Wow! Happy Anniversary! You have written a most beautiful love letter to your husband. Loved this post all over again. Happy Anniversary!! My hubby can also talk to anyone – if we’re in public, and I walk away for 5 minutes, and someone else is nearby, he’ll be talking to them when I get back. BUT my hubby is NOT the serious type. He makes me laugh all the time. This was a wonderful post. Congratulations on your 20 years together. Installing a generator is no small feat but the thought of making sure the hair dryer works, now that’s a good husband! Wow! He even has a Wikipedia article on him?!!!!! 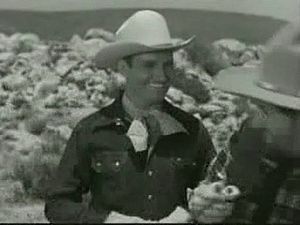 oh yeah, that’s Gene Autry. Well, that’s exactly how I’ve been picturing him, so I hope you don’t mind! Well, he’s not Gene Autry, but he’s definitely the Gene Autry type. I love him a lot, but two of him would be more than the world could bear. I’m sure your husband knows what a catch he has in you! This was a beautiful tribute. Also, it’s nice that you didn’t wait till he was gone to put into words what you think of him and some of the reasons why you love him. Beautiful! Even though I whine sometimes on my blog about my husband he really is wonderful. Ain’t it great!